At more than seven feet long and equally tall, this Egyptian icon will surely make a statement! 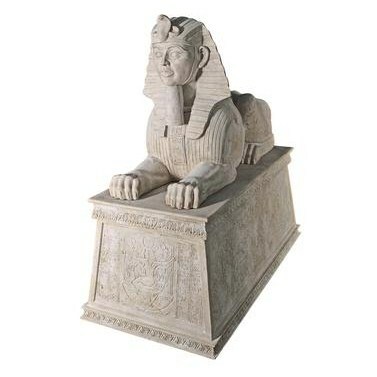 The Sphinx guarded the burial chambers of pharaohs and flanked the famous gates of Egyptian cities, so you can rest assured that your home or garden will be safe with him at the post. Our massive sphinx sits upon a plinth ringed with traditional, hand-scribed hieroglyphs and crowned with traditional lotus detailing. This large-scale, display-quality sculpture transforms any garden, restaurant, or public space into something truly magnificent! Cast in quality designer resin, the plinth is decorated with hieroglyph carvings and is finished in faux-limestone to resemble the weathered original statue. Each one is made to order and takes 6-8 weeks to create. Contact us with your shipping address and we will calculate shipping and handling.